It's been awhile since I finished a book. I don't have the patience to struggle through a story I'm not in to with the hope that it'll get better. A while ago, I kinda gave up on finding novels I enjoy. I read more manga than books. Then came Dark World. I love books where the POV characters aren't human and have powers. Kane is a 300 year old demon and Scarlet/Fate is a human turned shade. The story is set in the underworld. My kind of book. And, it's called Dark World. 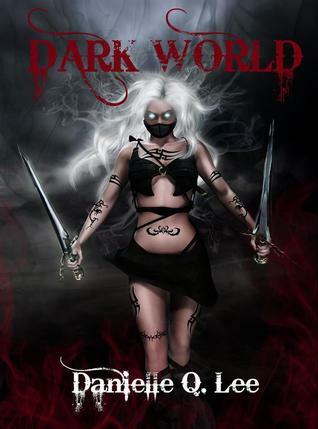 I'm a sucker for a dark world.The person on the cover looks like something out of an anime. This author knows how to crank up the suspence. She had my heartrate up from start to finish. I actually read this book at home, not just on the train. That rarely happens. I might have to read it again. I was so worried about the characters, I raced through the story. I probaly missed something important. The worldbuiling was on point. I like the author's take on hell. Scarlet's a teenage girl who became Fate, a shade. She's thrown into the underworld. Shades are these nasty monsters who don't have a mind of thier own. Every demon hates them. Fate's different. She held onto part of her personality. The whole tennage girl turned vicious monster could've been real irritating. I don't want a story about a girl whining about her fate *wink*. Shades can be badass. Fate had some moments. Most of the time, she was just a girl who happened to to be a shade. I wanted to see more of the badass side of her. There was this huge battle at the end and she didn't do any fighting. The story showed she was more than capable of taking down a demon or two. She wasn't totally pathetic so she didn't annoy me. The story is part romance between Fate and Kane. I enojed the romance but I didn't beleive it. I don't care for the whole instant connection trope. Fate and Kane where talking about how they loved each other and I'm like, "how did that happen?!" I had to shelve my disbelief. But, I didn't hate the idea of them being in love. I just needed more. They meet and then 2 or 3 days later they're talking about love. The story threw in another male. I'm not a fan of love trianlges. I had to stop reading to take a look at the Goodreads reviews. Fortunatly, Dark World didn't have a love triangle. The story aslo had the chosen one trope. I like that only in Harry Potter. I don't particualrly care for stories where the character is special for simply existing. That part of Dark World did annoy me but not enough to stop reading the book. Dark World was a fun read. And, it's free. I'm trying to figure out how I missed this book. It was published in 2011. That’s what Scarlet Prince became after she was damned to a nocturnal world crawling with sphinxes, gargoyles, and necromancers. If only she’d heeded the warnings of the local legend, none of this would have happened. With a dark destiny haunting her and unearthly powers she can’t control, she is torn between freeing the inhabitants of Dark World and satiating her lust for souls, until she finds the one thing she never expected in a war-torn netherworld: Love. Only he’s the enemy. Loving him could very well destroy the entire realm—and every human on earth.